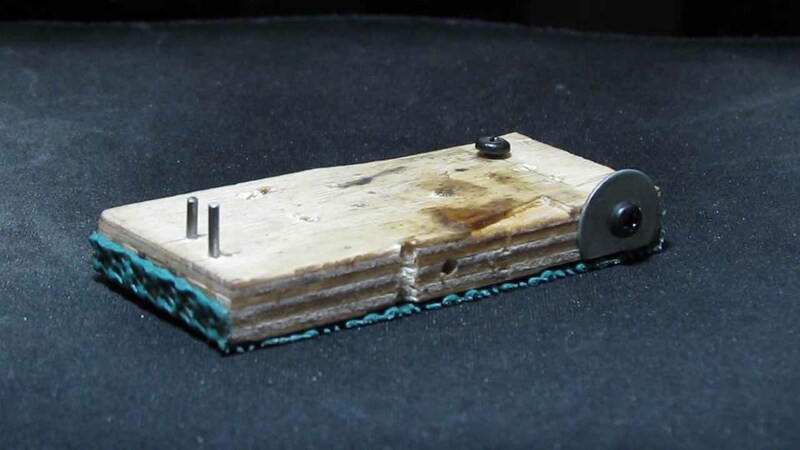 I made this a few months ago and use it to solder motors into all of my flexi chassis. 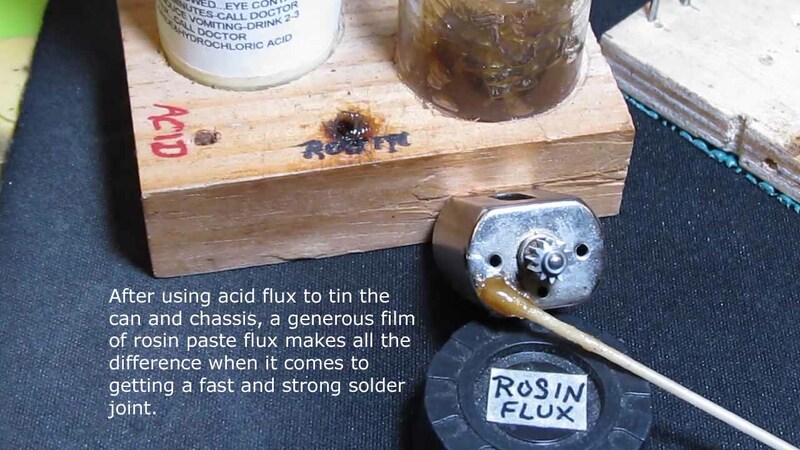 Some of you might find the idea useful, especially when it comes to soldering in Phoenix motors. A couple of weeks ago I soldered a Phoenix motor into a chassis. It was pretty easy because the fixture keeps the chassis from moving around. The width of the fixture is about 33mm. It has rubber drawer liner underneath to keep it from sliding around on the workbench. I also use an alligator clip to hold that rear brace in place. It likes to move elsewhere if I don't. I also suggest after you turn it over and solder the rear bracket in that you now also resolder the main side joint from the bottom for added strength. This is standard procedure on this type of chassis. All good!, and this is the sort of thing that people new to slots might not think of, but that people who've done these things for a while need to come up with. This is what I like to think of as "kitchen table engineering", and nothing is more a part of the history of slots more than that. As an aside, this isn't really so much a "Phoenix" thing as a general "fk" thing right? I applaud the use of making your own tools. this is the sort of stuff we used in wing cars in the 90's. I am sure people still use similar. I have a stone block for home, but carry aluminium to the track. (have to cut them down as newer stuff doesn't fit) but I took for granted when I use them for anythnig I am soldering anymore. Flexi included. Mostly just play with lots of cars. 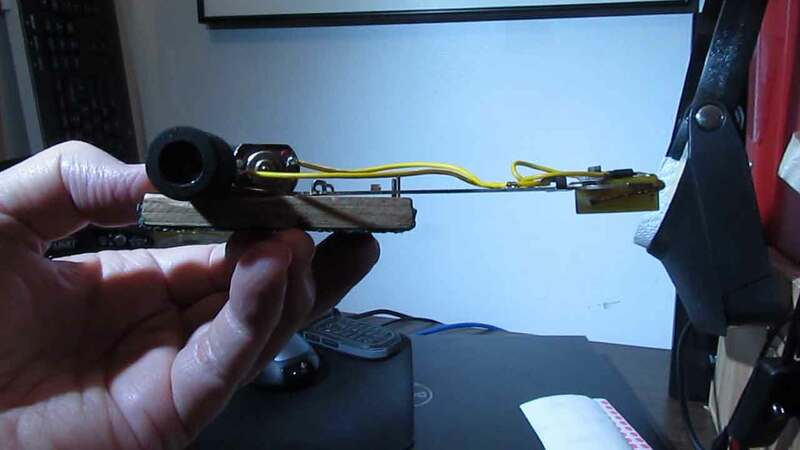 Able to maintain slot cars with a single bound. Faster than a speeding womp. Corian cuts much easier than metal, is NOT a heat sink like metal or stone, and does not burn too much. The stuff we use for chassis building fixtures. Proving once again a tool doesn't have to be pretty, it just has to do the job. Am I the only one thinking the magnets in the Phoenix motor are overkill? Can't complain too much as so far the little critters seem to be fast and reliable. The light at the end of the tunnel is almost always a train. I have a Corian block that had embedded magnets in it. I tried it with my Mossetti and C43 chassis and it works great. Makes installing the Phoenix motor a breeze. I normally don't use it because it's bigger and heavier then my Wright Way phenolic block. Guess I'll have to carry it to the races for those motors. 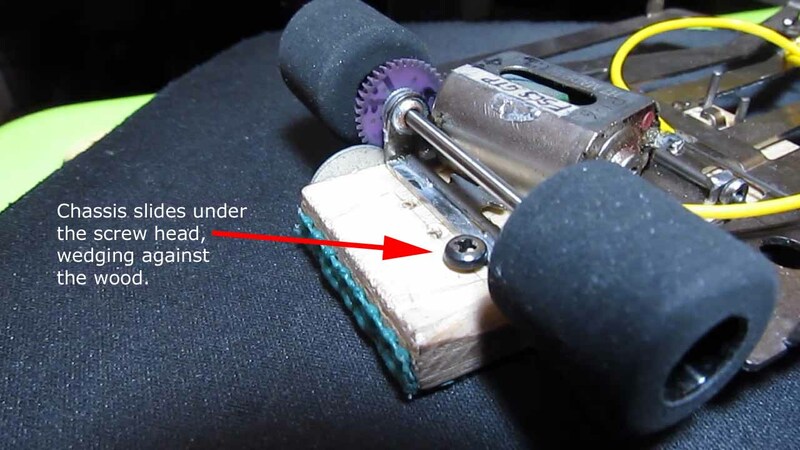 Or Fred, you could drill & embed magnets in your lighter weight block. If you use some of the super magnets, drill from the block's bottom, but not all the way through the block. Great little fixture. I made a copy of it. thanks for sharing your idea. When you say "rear brace", the only thing I can think of that you're referring to is what I'm calling the rear motor mount, which in all of my chassis, is more or less permanently soldered in place. Do you routinely unsolder yours? Bill, my Wright Way block is dual purpose, one side has magnets and cutouts for mounting motors and the other side is a standard tech block. Dale, yes some of us routinely reposition the rear motor brace to accommodate different motors or different gear sets. I have a limited amount of chassis, for those racers who can afford several chassis for each class they race that's not really necessary. 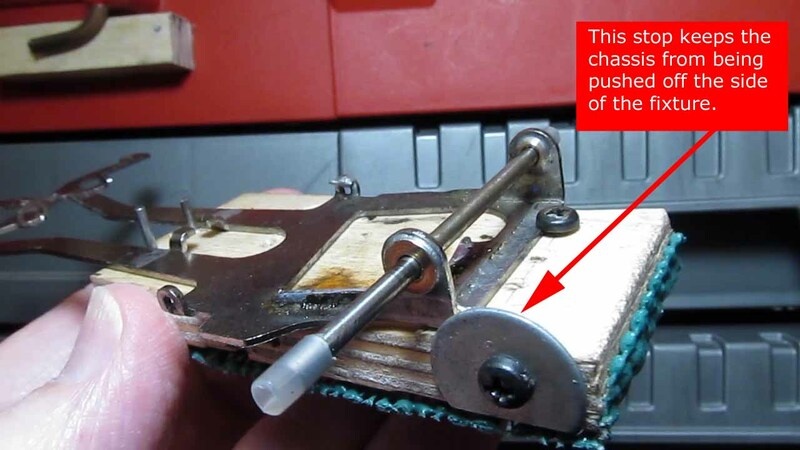 When I position my rear motor brace I use a popsicle stick to hold it in place while I tack solder each end of the brace. Mossetti chassis accept solder very well so tack soldering each end is all I really need to do, it also makes them easier to remove. On my C43s I tack solder each end and the middle. I'm not so sure about the gap between the rear of the motor and the brace. It seems like a weak spot. Also, in the picture the motor looks like it's raised higher than the bottom of the chassis? I'm actually like a little bit of a a gap between the motor and brace. I can change a motor easier and less heat on the motor as well. Test, test, test and go test some more. ^^^ Less heat on the motor?? Easier to flick the solder out between the motor and brace. Less time on holding the iron on the motor and brace. Even if it's only a tenth of a second. I just tried to break the motor out of the chassis that's in the pictures in post #1. It feels like the chassis will bend before those solder joints break. Earlier this year my car got nerfed (my fault) in a high bank. It bent the chassis arm and guide tongue but the motor didn't come loose. 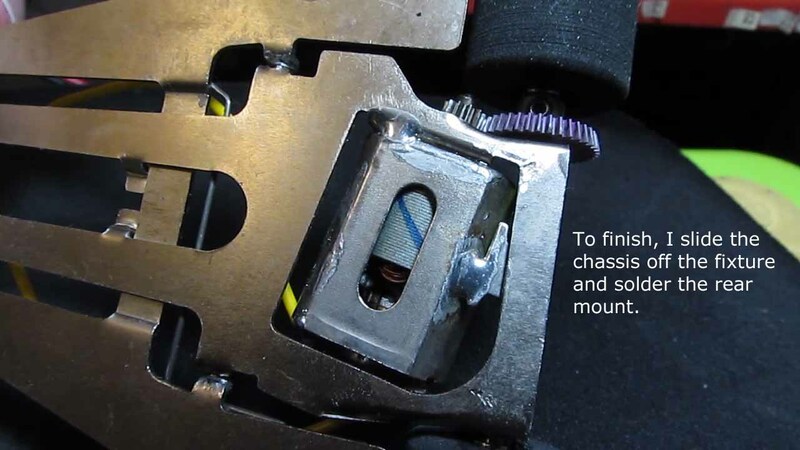 The gap between the motor and rear mount is not weak enough to be an issue, and like DZ said in another post, it makes changing the motor easier (quicker). Just melt that solder and give the chassis a little flick, and the motor is now only held by the solder joint at the front corner. 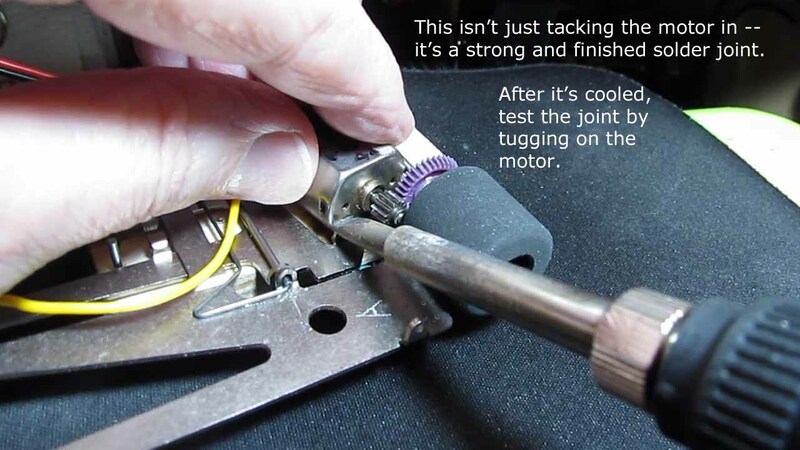 Then apply heat to that joint for usually about 3 to 4 seconds and the motor drops out of the chassis. DZ is known for changing motors during 2-minute lane changes. Regarding the motor looking like it's raised -- the motors come out flush with the bottom of the chassis. 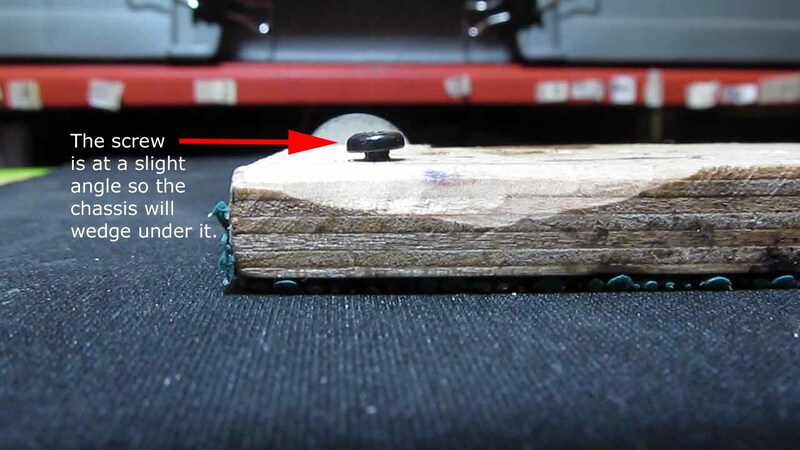 If you look at the second picture in post #1, you can see that the motor box sits flush on the wood, and then the motor also sits on the wood. Which ever picture you're referring to is just an optical illusion. The Phoenix came out fairly recently but I've been using the mounting fixture for months. The owner of the local raceway recently commented about what a pain it was to solder in a Phoenix but he was just doing it on a bare block. That's when I gave it a try on my fixture. It's certainly more of a wrestling match than a Hawk 7 and the like, but all in all, not too bad. After reading all the responses. I thought it was all me and my screwup getting my Phoenix soldered in. Great tips, very helpful, and MAHALO for sharing! I kick the rear ends up on all of my flexi chassis so I assume I couldn't use a magnet type fixture. A magnet type would require the chassis be flat -- right? Dale, what do the rear end kick-ups give you?. My days running a flexi ended 15 yrs. ago & now there aren't any raceways left in the state. I used to run my chassis flat, but would sometimes move the rear axle location up or down as needed. 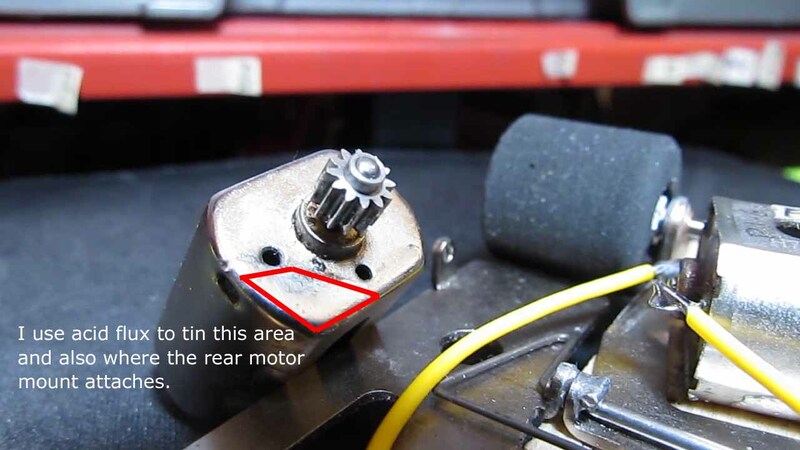 I have a small machinist vise and small c clamp and fender washers to setup the angle and meshing of the gears, re-positioning the motor get the meshing I want and run the motor if the gearing is noisy or quiet then solder motor to chassis.